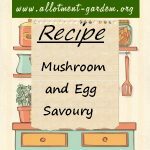 Recipes using mushrooms in the ingredients. 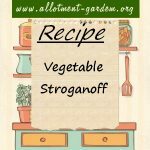 Recipe for Vegetable Stroganoff. Serve hot with rice, noodles, mashed potatoes or with baked potatoes. Enough for 4 persons. Recipe for Pickled Mushrooms. Best if left for at least 2 weeks before using to allow the mushroom flavours to develop and strengthen. Recipe for Cream of Mushroom Soup. Serves 4 - Nice if served with croutons of fried bread. This is a very rich and satisfying version of mushroom soup. This delicious mushroom flan can be eaten hot or cold. The most important thing is to use good quality, flavourful mushrooms. Recipe for Mushroom Roast. Serve in slices with new potatoes and other veg of choice. 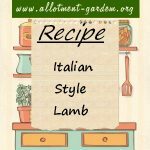 Some home-made tomato sauce goes well instead of a "gravy". Recipe for Mushroom Ketchup. Similar to Worcester sauce in consistency, mushroom ketchup adds a lift to any meaty soup or stew, or in a marinade. Recipe for Mushrooms & Potato Casserole. 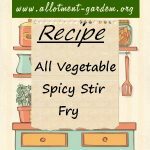 Serves 4 to 6 with some extra side dishes as a main course. 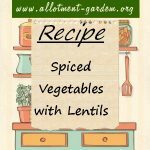 Recipe for Spiced Vegetables with Lentils. Goes well with brown rice or with some crusty bread to dip up the sauce. Serves 4. Recipe for Vegetarian Cottage Pie. 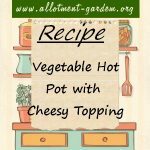 Put in a medium oven and cook for about 30 minutes until golden on the top. Serves 4. 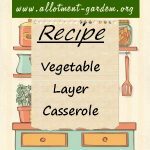 Recipe for Vegetable Layer Casserole. A tasty recipe using your home grown vegetables. Serves 4. 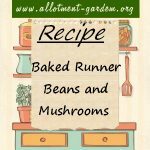 Recipe for Baked Runner Beans with Mushrooms. 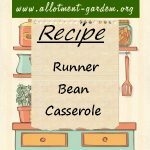 Makes a light lunch or supper dish on its own when served with hot crusty bread. Serves 4 or 6 as a side dish.